Need to find a pet friendly hotel in Carson City NV? Click the Pet Friendly Accommodations Button below!" 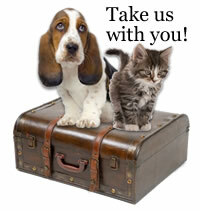 Finding pet friendly hotels in Carson City is easy with PetTravel.com. Click the SEARCH PET FRIENDLY ACCOMMODATIONS button above for a list of pet friendly hotels, motels, bed and breakfasts, small inns, and vacation rentals in Carson City. You can even book your reservations on the same page! We have over 57,000 pet friendly hotels and accommodations in 5,000 cities around the world where you can take your dog or cat. Just fill in the box to the left and search our database. Traveling internationally with your pet? Look up pet immigration rules for over 147 countries and find the necessary forms by clicking on PET IMMIGRATION INFO under Directory on the left. Pet friendly airline rules can also be found in AIRLINE PET REGULATIONS. We even offer pet sitters in selected cities who will "petsit" your best friend while you go out to dinner in Carson City.